Disneyland corn dogs are legendary among Disneyland locals for a good reason. They are giant, cheap, and most importantly delicious! They are hand dipped right before serving so you will hardly ever get a stale corn dog. Believe the hype. Guy is not the only one that raves about the corn dog at Disneyland, L.A. Weekly’s Pulitzer Prize-winning restaurant critic Jonathan Gold has stated that the corn dog at Disneyland is the best he has ever eaten. So, what makes these corn dog so dang special? Well, it is actually pretty simple, and Gary Maggetti, Director of Food and Beverage for Disneyland Resort and Disney World, explains the originals of the Disneyland corn dog and why it is so magical in the video below. As you can see, the key is the thick and warm hand-dipped batter. The corn dog at Disneyland is the perfect blend of sweet, salty, soft, and crunchy. It is a must have when visiting Disneyland. Now that I made you all hungry, I bet you are wondering where you can experience this spectacular corn dog, right? 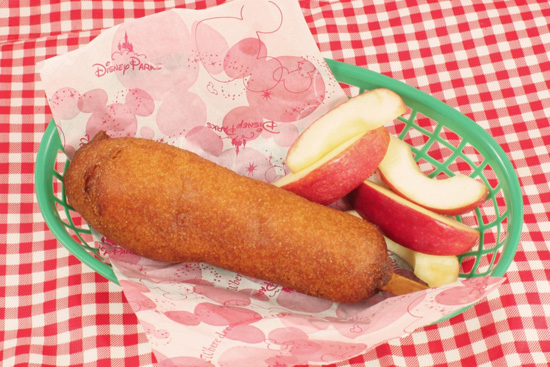 Well, there are only two places to go to grab a corn dog at Disneyland: Little Red Wagon Corn Dogs and Stage Door Cafe. The Little Red Wagon Corn Dogs is located at the end of Main Street U.S.A. next to the Plaza Inn (which has amazing fried chicken) and Stage Door Cafe is in Frontierland, right next door to The Golden Horseshoe. Do not worry Disney California Adventure visitors, you can also get your hand-dipped corn dog perfection here as well. 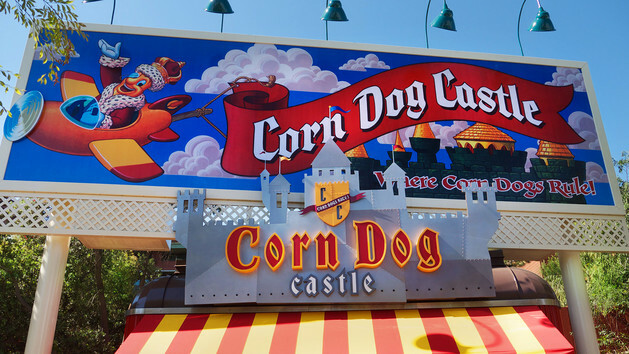 All you need to do is head on over to Corn Dog Castle in Paradise Pier. Purists may insist on only hitting up the Little Red Wagon; however, there is an advantage going to California Adventure’s Corn Dog Castle. Corn Dog Castle has 3 different corns dogs to choose from: original (same sold at Disneyland), hot-link corn dog, and cheddar cheese stick. TouringPlans’ Researcher Guy highly recommends either the original or the hot-link corn dog but he does advice you to stay away from the cheddar cheese stick because if you do not eat the cheese stick quickly, it will “become a lukewarm brick of solid cheese.” Oh yeah, either place you go to purchase your corn dog, you get to choose between a side of sliced apples or a small bag of chips (I recommend getting the sliced apples). So, when you are walking around Disneyland or California Adventure, and your stomach starts to rumble, try your best to remember the corn dog. If you forget where to get this magical dog, just ask a Cast Member. They will always point you in the right direction. What are some of your favorite quick service foods to eat at Disneyland or Disney California Adventure? Should Disney bring over the hot-link and cheddar cheese stick to Disneyland? Do you think Disneyland’s corn dog are better than the Magic Kingdom’s or do they taste the same? I love the Cheddar Cheese on a stick, such yummy deliciousness (and it’s a vegetarian option if you want to try the corn dog batter). One interesting note – there is no garlic or onion in the corn dog batter (which is important for a friend of mine who has an intolerance for that). That’s great to know. Thanks for the info! We went to Rancho del Zocalo Restaurante when we were in DL. My 8 yo is not a fan of foods she doesn’t know. After we ate, brought up the TP app, saw that there were corn dogs right down the way at Stage Door, grabbed her one and she loved it. My family got our corn dog at the Corn Dog Castle in May. It really was super delicious. My daughter is extremely picky about her corn dogs. She said it really did make the mark for being one of the best she had ever had.